Gardens of Stone: The "Prime Minister of the Underworld." The "Prime Minister of the Underworld." Frank Costello, born Francesco Castiglia, was luckier than most of his mob cronies --he died a natural death at the age of 82. Having survived a 1957 murder attempt by Vincent Gigante-- a low-level criminal at the time—Costello later refused to identify Gigante as the shooter. Nicknamed the “Prime Minister of the Underworld,” Costello was a Mafia leader who wanted to be accepted as a businessman and member of the establishment. Unlike the majority of his peers, Costello was said to eschew violence He cultivated refinement and sought out sophisticated friends among New York's established bigwigs and politicians. These men curried his favors to such an extent that the underworld grapevine claimed, "Nobody in New York City can be made a judge without Costello's consent." During the Kefauver hearings on organized crime in the mid-fifties, Costello was front and center. At least his hands were, as the networks agreed not to broadcast his face. When the committee asked what he had done to speak of as an American citizen, Costello answered “Paid my tax!” Laughter erupted in the hearing room. On February 18, 1973, Costello suffered a fatal heart attack. His wake began the next evening at the Frank E. Campbell Funeral Chapel. 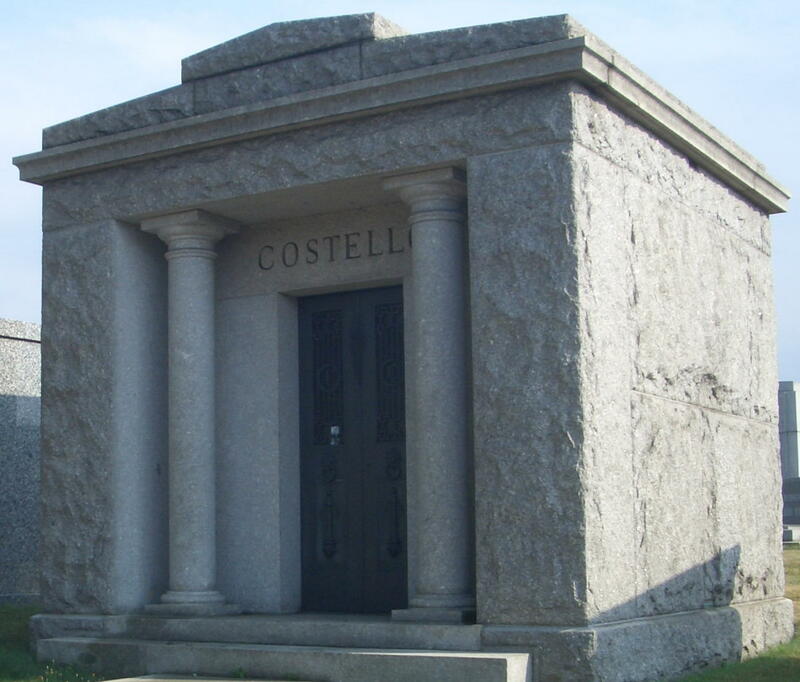 Dressed in a navy blue suit, dark blue tie and white shirt, Costello reposed in a walnut casket. During the two days of visitation, approximately 125 people came to the “Williamsburgh Room” to pay their respects to the former crime boss. Costello’s funeral, which took place on Wednesday, the 21st of February, was a subdued affair, especially by gangland standards. A sole limousine transported Costello’s widow, Loretta, and his brother-in-law to St. Michael’s Cemetery in Queens. Newspaper accounts estimated the mourners --along with the requisite law enforcement --who gathered at the grave site for a brief ceremony to number about 50 people. Most of the prominent people Costello had associated with stayed away. However, storied restaurateur, Toots Shor -- whose establishment Costello had frequented -- was there. “He was very fine and decent, a good family man,” Shor told reporters. Costello was entombed in a private family mausoleum. Built in 1949, at a cost of $18, 615 plus $4,888 for the land upon which it sits, the granite structure sports bronze windows and doors. 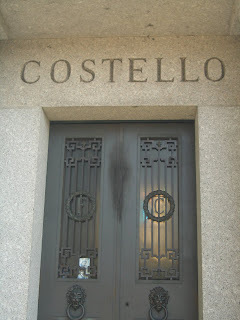 On January 25, 1974, the bronze doors were blown off, reputedly by Costello’s old nemesis, Carmine Galante, in a symbolic act of revenge.